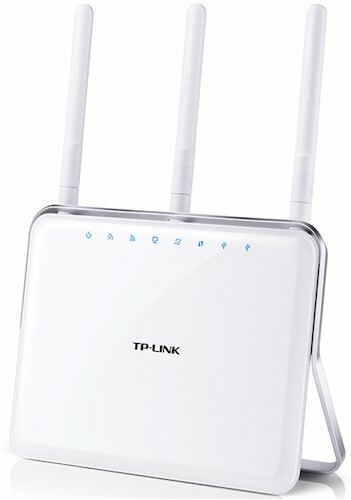 With the Archer C9, TP-LINK finally has released its first AC1900 class router. It's quite late to market, given that the first of its competition introduced AC1900 routers well over a year ago and followed up with AC2350 and AC3200 products last summer. But TP-LINK AC1900 is here now, so let's see what it brings to the party. You could easily mistake the C9 for its AC1750 class Archer C8 sibling we reviewed a few months ago. If it weren't for the product number on the label on the back, you couldn't tell them apart. Connectors, lights and packaging are identical, so I just copied the callout graphics below from the C8 review. All the physical design comments there apply to the C9. As with the C8, the C9's rear panel has only Gigabit Ethernet (with no Link / Activity lights) and USB 2.0 ports, Reset / WPS button and power switch. The USB 3.0 port is on the right side panel aside a wireless on / off switch. Most of the back cover is perforated for cooling. The C9's board design continues the very-much-like-the-C8 theme. The board shot below has a heatsink very similar to the C8's. And with the heatsink and RF can tops removed, the internal board is eerily similar to the C8's. In fact, you can judge for yourself with the composite image below. The C8 board is on top; the C9 on bottom. The C9's key components are summarized in Table 1 along with the C8's. Basically, this is an Archer C8 with a Broadcom BCM4360 swapped in for the BCM4331 for the 2.4 GHz radio.